Ahmadinejad Condemns Capitalism; "We Need to Revert to the Divine Mindset"
Right, so capitalism (read, "The West", infidel United States of America) is responsible for the oppression of countless women, men and children in so many countries. Is it just me, or does this comment sound ignorant and ironic. But Ahmadinejad is not ignorant. Rather he is employing the tactic of sidling up to the raft of leftist anti-capitalist groups established in the West - themselves dedicated to the dismantling and destruction of capitalism. Ahmadinejad said world leaders, thinkers and global reformers should "spare no effort" to make practical plans for a new world order that would reform international economic and political institutions. To spotlight the importance of this effort and the need for all countries to participate, Ahmadinejad proposed that the United Nations name the coming 10 years "the decade for the joint global governance." 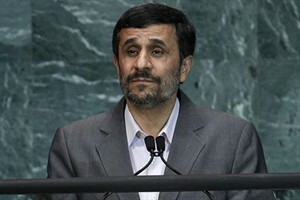 In his brief speech, intertwining philosophy and religion with the current state of the world, Ahmadinejad declared: "The undemocratic and unjust governance structures of the decision-making bodies in international economic and political fields are the reasons behind most of the plights today humanity is confronting." "It is my firm belief that in the new millennium, we need to revert to the divine mindset ... based on the justice-seeking nature of mankind, and on the monotheistic world view...," the Iranian leader said. "Now that the discriminatory order of capitalism and the hegemonic approaches are facing defeat and are getting close to their end, all-out participation in upholding justice and prosperous interrelations is essential." Intriguing really, isn't it. Ahmadinejad the humanitarian. He cares so much for the oppressed of the World that he is seeking to free them all through a new form of global governanace, one that has reverted to "the divine mindset". Capitalism has failed the World he maintains - so it's time for something new. What is the Iranian President's mission here? Is it soley to promote the overthrowing of capitalism - friend of freedom and independence? Or is it merely a thinly masked attempt at citing the ideology of Islam as the answer to the World's woes? I don't know about you, but I'm convinced that a global-governance based in the principles of Islam is the last thing the World needs. "I don't know about you, but I'm convinced that a global-governance based in the principles of Islam is the last thing the World needs." Running a pretty tight race with the United Nations for the last thing the world needs, but then again, they pretty much seem to have mutual goals. "we need to revert to the divine mindset"